It’s a given that photographers bring a lot of stuff wherever they go. Thus, having the right storage to keep their camera as well as its accessories, such as lenses, filters, and other gear, is important. This will ensure that everything is not only well-organized but also well-protected from the occasional bumps and scrapes that come with traveling. Whether you’re a professional or an amateur, the manufacturer of the Beschoi DSLR Camera Backpack claims that it is a great bag to carry your gear. Now, let us determine if it offers great storage and is designed with functionality and organization in mind. There are many features to love about the Beschoi DSLR Camera Backpack. Although it is designed with an overall minimalist look, once you open the bag, you’ll be quite impressed not only because of the interiors but also the functionality it offers. Keeping your gear properly arranged and sorted according to function and frequency of use allows you to become more efficient during a shoot. It saves time and prevents you from rummaging inside your bag to look for something you need to use. Being organized also prolongs the lifespan of your gear and minimizes unwanted damages such as scratches on your lenses or breakage. This is exactly what this bag offers. A separate compartment, located at the back of the bag’s front cover, is designed to hold a laptop. Aside from the compartments, additional pockets can be found in the bag’s interior and exterior for added storage. Dividers are important when you want to store stuff snugly but still be able to separate each of them according to how you want them arranged. The dividers are also movable, so it’s not only useful as a camera bag but can also serve as a daypack for use when traveling casually. The heavy padding serves a dual-purpose as it protects your gear and also provides comfort when you carry the bag. The bag is heavily padded on the shoulder, chest and waist straps. The interior storage is also well-padded since it stores your sensitive optics. Heavy padding ensures that everything inside the bag is resistant to shocks and scratches. This is an important safety feature to consider since it’s a fact that electronic equipment should not be exposed to water, even moisture if you want to prevent it from getting damaged. Additionally, you also get another layer of protection with the customized honeycomb plate. For some people, it’s a decent-sized bag but still quite small for their needs. This is sort of a minor drawback, depending on the type of camera, laptop and accessories you want to put in. The Beschoi DSLR Camera Backpack is a product that can withstand constant use and abuse since it is made of waterproof materials and has been assembled using heavily reinforced stitches. The interlocking zippers are also anti-theft to ensure that your precious equipment is protected. 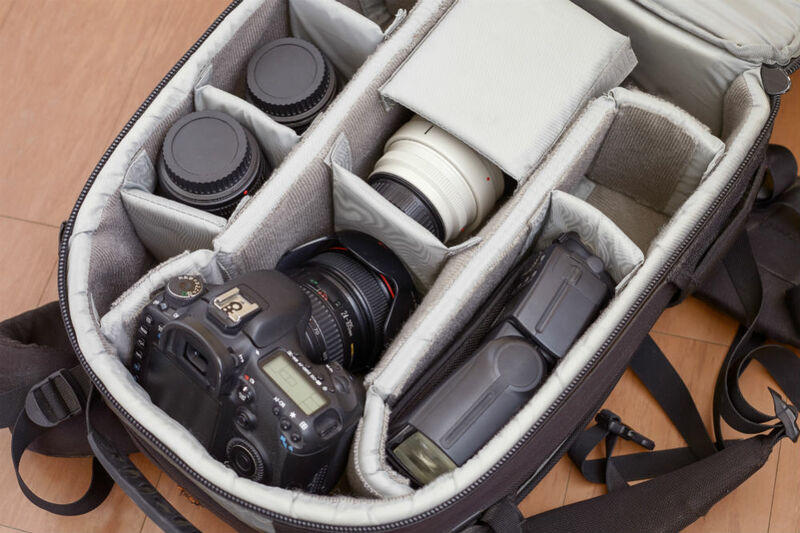 Further, the large compartment of the bag can hold your camera, most of your gear, and your laptop. Configuring the bag’s interior is fun since you can re-arrange it according to your kit. It’s also quick and easy to do so since the dividers use Velcro. In addition to the main compartment, the bag has both small and big zippered pockets where you can keep small items such as memory cards, phone, cables, and keys. Aside from keeping your gear safe, your comfort is also considered. That’s why the ergonomic straps are designed to distribute weight throughout your body well. Optimal padding has also been incorporated throughout the bag to give both comfort and protection. Although this backpack has a size that can carry multiple items, it still might not suit the needs of photographers and videographers who have more accessories. Nevertheless, all in all, the bag’s dimensions and capacity are both able to hold most average-sized cameras and equipment. A product that looks very similar is the Powerextra Multi-function DSLR Camera Backpack. It’s easily comparable to the Beschoi DSLR Camera Backpack with its black and red color combo. It can also hold 1-2 cameras, five lenses, a 14-inch laptop, and a flashlight. Looking at the bag’s exterior first, it also has a zippered pocket on the front. It also has a tripod pocket on the side as well as a mesh pocket on the other to hold items such as keys, phone or a small water bottle. It’s also made of waterproof Oxford, nylon, and polyester materials. On the other hand, the interior also features several padded compartments for easy organization. What’s great about these is that they’re also removable, so you can easily switch from a camera bag to a travel bag. In addition, the main compartment is spacious with or without the padded compartments. Although both products look similar, the Beschoi DSLR Camera Backpack looks a bit more polished on the outside. Inside, the Powerextra Multi-function DSLR Camera Backpack gives a bit more extra in keeping everything snug by adding a layer of zippered padding that covers half of the main compartment when you open the bag. However, the zippers would not provide the security level the zippers of the Beschoi Backpack offers. Keeping your camera and its accessories safe and in good condition is a priority. That’s the reason why choosing a high-quality camera backpack is also a necessity. If you’re looking for a good quality backpack that is still budget-friendly, then the Beschoi DSLR Camera Backpack is a great choice. As a camera bag, it’s spacious enough to fit all your essential gears in one pack. What’s really great about the bag is the multiple compartments that you can adjust and rearrange according to your needs. Additionally, it is heavy duty and heavily padded which is very important considering that most of what’s inside the bag is fragile. When it comes to design, this bag can be considered minimal in a stylish way. At first glance, you won’t really think of it as a camera bag, unless you have a tripod attached. Nevertheless, it’s a versatile backpack that you can also use for light traveling.